Robert Herrick. The Welcome to Sack. As I meet thee. Soul of my life and fame ! Out-shine the splendour of his mid-day beams. The smoky chimneys of his Ithaca. Did rather choose to bless another clime ? By thy short absence, to desire and love thee ? Favours on me, her fierce idolater ? Purge hence the guilt and kill this quarrelling. Wo't thou not smile or tell me what's amiss ? To testify the glowing of a spark ? In hot adult'ry with another wine ? Whose love grows more inflam'd by being foes. A thought of such-like possibility ? Like Iphiclus, upon the tops of corn. My genius with a fuller blandishment ? God, and far more transcendent than the rest ? As the wise Cato, had approv'd of thee. Ne'er had kept heat for fifty maids that night. To the triumvir love and wonderment. Run through my veins like to a hasty flood. The time that I prevaricate from thee. Run to a sudden death and funeral. Ne'er may prophetic Daphne crown my brow. 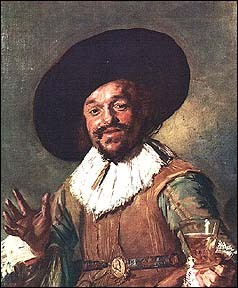 Frans Hals. The Merry Drinker. 1627. Ithaca, the home of the wanderer Ulysses. Iphiclus won the foot-race at the funeral games of Pelias. London, Lawrence & Bullen, 1891. 93-97.